If you do not have a copy of PowerPoint, you can download the viewer from Microsoft here. Do you know how many hours are on your aircraft? How about hours on your engine and prop? The answer is, more than likely, yes. At least you have a pretty good idea. What about your engine appliances, such as; the starter, alternator, mags, prop governor, vacuum pump or fuel system. You might think they all have the same time as the engine. This might not be the case. Sometimes an engine gets changed or overhauled and the appliances are simply swapped onto the new engine. There are many scenarios in which this could be true. Maybe you’re running your engine past TBO. If so, your appliances are too. Your starter or alternator brushes could be worn to the point of failure. Magnetos, with worn points and brushes, dry bearings or leaky seals or carburetors, with worn linkage or loose bowl screws. Vacuum pumps, with high time could be on the verge of failure. I think you get the idea. Many times, these components don’t receive a whole lot of attention. Until they fail...like, 5 o’clock, on Friday, sitting at the customs dock at I-Falls (if you’re lucky). A good Sunday afternoon project would be to review your log books. Try to determine the TTIS (or since last inspection) of all engine accessories. Then discuss with your mechanic the possibilities. 500 or 1,000 hour inspections might be performed. Maybe overhaul or exchanging certain components is in order. This would also be great time to consider some of the lightweight items available. You can shave a lot of weight by installation of a lightweight starter, 8 to 12 pounds depending on the engine. One could save even more weight if you upgrade your generator to an alternator. I just installed a lightweight starter and battery on my 172. A savings of 18 pounds! That’s three gallons of gas or in more valuable terms, one case of beer! A greater useful load is always a good thing. Don’t wait until the worst, most expensive time to find out the condition of your engine accessories. If you are doing the annual inspection on your plane this winter or you are looking for a weekend project, try this. Something that is usually not done during a routine annual is to remove the interior side panels. Remove the front side panels and insulation next to the rudder pedals. On older Cessna’s in particular, look for corrosion on the side skins of the fuselage and on the floor. Many times we find glued on sound deadening panels are loose and there is moderate to severe corrosion underneath. 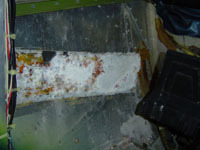 These gray panels are also found under the floor and down the tunnel in the empennage. Cessna had the brilliant idea of using “lead vinyl” panels as a sound deadener. Dissimilar metal when mixed with a little moisture from a leaking windshield, you’ve got a recipe for corrosion. Cessna issued a bulletin about these panels coming loose and how to re-glue them. Get rid of them. Earlier models have a sprayed on, tar like material. This material doesn’t seem to be a problem. Also look at the floor around this area. Spilled beverages or mouse urine really does a number on the bare aluminum too. Speaking of mice, check for mice nests under the side panels, also. The rear side panels and up in the headliner are places to take a close look. They love to gather insulation and stuff an area full. Replace any damaged insulation and definitely treat areas that have been affected by mouse urine. Consult with your A&P about treating corrosion. When reinstalling the interior, be sure to use the proper length hardware. Keep in mind the possibility of plumbing, wiring, etc. on the backside of doorposts and under floors. This is also a good time to lube anything that might normally not get done. The last several issues of Cessna Pilots Association magazine had an excellent series of articles about interior and corrosion problems. I advise all of my Cessna customers to become members of CPA.